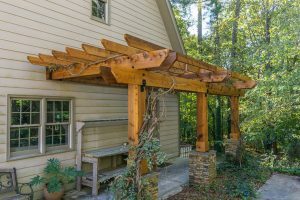 One of the delights of living in the Cherokee County area is the opportunity homeowners have of enjoying magnificent outdoor scenery right in their own backyards. 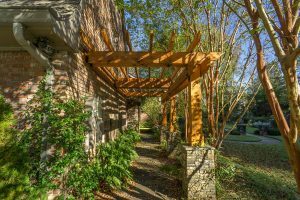 For years our clients had been enjoying the surrounding panorama of many towering trees from their simple uncovered wooden deck. Now they were dreaming of a screened porch that would provide them with the same gorgeous views, but protect them from wind, rain and insects. See more photos of this beautiful project on Houzz. 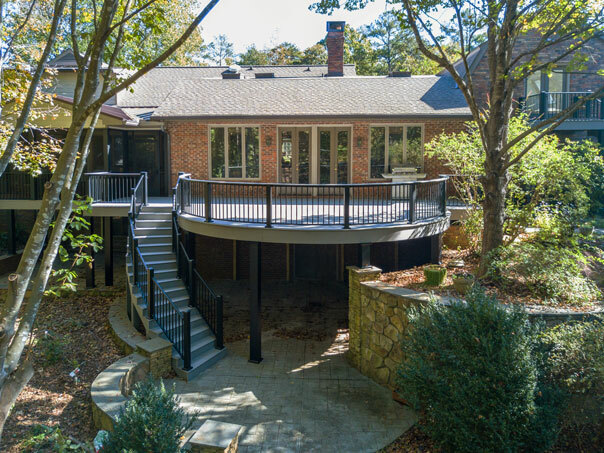 The Atlanta Design & Build team worked with these homeowners to transform their existing open deck into a delightful screened porch with tall, expansive windows. In addition to the tremendous scenery, one of the main focal points of the space is the gorgeous fireplace. Constructed of fieldstone veneer with stone slabs for the mantle and hearth, the fireplace gives the porch a rustic vibe. The stained white pine vaulted ceiling and gray pickled shiplap wall covering above the mantle reinforce that look. Natural rough cut post and beam cedar, along with matte black balusters, continues the rustic feel of the space. The sun-beaten wooden boards from the original deck were replaced with Trex composite boards that offer the realistic look of wood along with valuable low-maintenance. This English Country home in an idyllic woodland setting next to the Chattahoochee River in Marietta, GA, is finally fulfilling our clients’ wishes. The homeowners desired a large deck and screened porch that increased their home’s functionality for entertaining, and was constructed with such expertise they would never have to replace their deck again. The Atlanta Design & Build team discovered the existing cedar deck was badly deteriorated and unsafe to use. The railings were loose and could easily be pushed over, and the wood was not holding up to the weather. As our team worked on the main curved section of the deck, we removed everything from the structural joists up, replacing the handrails and decking. The new decking is a Fiberon composite. To curve the decking boards around the perimeter of the deck, our supplier heated them in a 9ft oven at their facility until they curved properly. We removed the old cedar wrap from the steel posts and installed a new metal decorative post wrap to match the black railing system by Westbury. Building the curved stairway, repeats the curved design of the entire outdoor space. 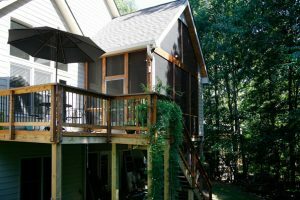 The existing framing for a section of the deck was so inadequate the deck bounced up and down when the homeowners walked on it. Previous repair attempts to stabilize it had not worked. 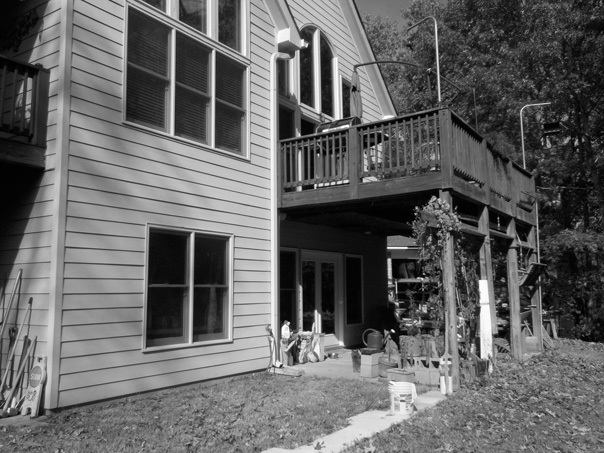 Our ADB team removed that entire portion of the deck and in its place built a screened porch. See more photos of this beautiful project on Houzz. Gorgeous Brazilian OHC Ipe hardwood covers the screened porch floors. Tongue & groove wood was pickled to let the wood grain show through and installed on the ceiling. The existing exterior brick walls offer additional texture. The focal point of the space is an impressive wood-burning fireplace with real stone hearth and mantle. The stone was sawn in half to decrease its weight. The ADB team also rebuilt four cedar arbors in the front of the house and on the garage, while keeping the original vines intact. The decorative and very attractive OZCO brackets are a fastening system that was used to tie the whole structure together. Our clients are very pleased with their new deck and screened porch. For the past several years they have not been able to use their deck because it was unsafe. ADB carefully built our clients’ new deck to building code standards. Now the homeowners are excited about the entertaining possibilities their new space affords. When you are looking to enhance your outdoor entertaining possibilities, our skillful ADB Team are the experts to contact.